Here's a wonderful little program that delivers exactly what it promises: trouble-free control over your printed output. 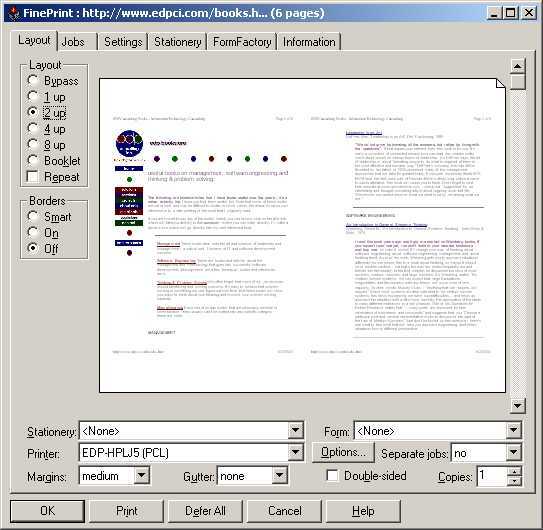 It allows you to effortlessly print multiple pages onto a single sheet (anywhere from 2-8), superimpose watermarks on printed output, collect printed output from multiple sources and then number/print them as a single document, delete individual pages before pringing, print booklets, preview printing, embed letterheads, and more. FinePrint installs into your "Printers" folder and looks and operates like a standard printer driver (it's a "virtual printer driver" in technical terms, meaning that it looks and acts like a printer, but isn't directly connected to any physical printer). You can control all the features from the FinePrint screen, select the physical printer that you wish to print to, and then print the document. Here's a sample of the dialogue box that appears one you've printed a document from your application (Internet Explorer, in this case). To print the document, simply click the "OK" button and you're done. Optional controls are available through easily accessible tabbed windows or drop-down boxes.